A toughened unit starts life as individual components travelling across continents. 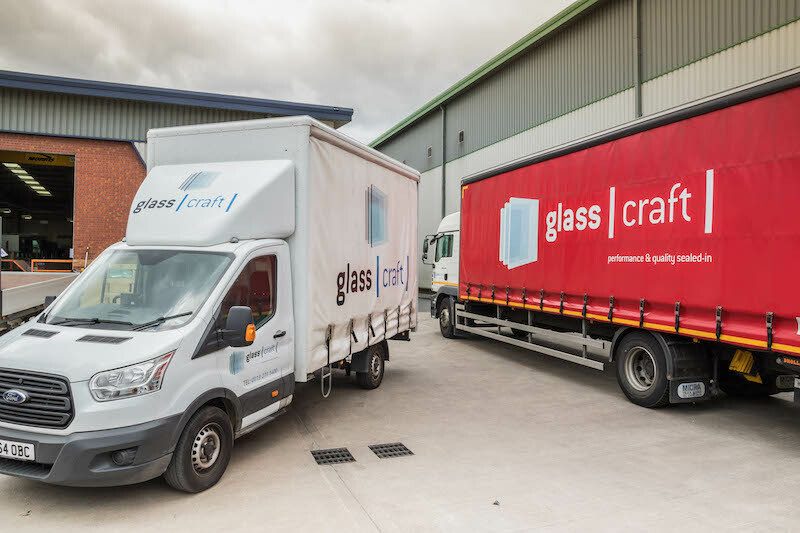 The glass is sourced in the UK and comes into our factory in packs of 20+ sheets measuring 3210mm x 2550mm. These packs are off loaded using over head cranes. The individual sheets are then transported to our cutting tables and optimised to achieve the least waste. Low e products have to be edge deleted (have the low e coating ground off around the perimeter), as well as undergo the cutting wheels. The individual rectangles/shapes of glass are then snapped out of the sheet and stacked in order for the next process. 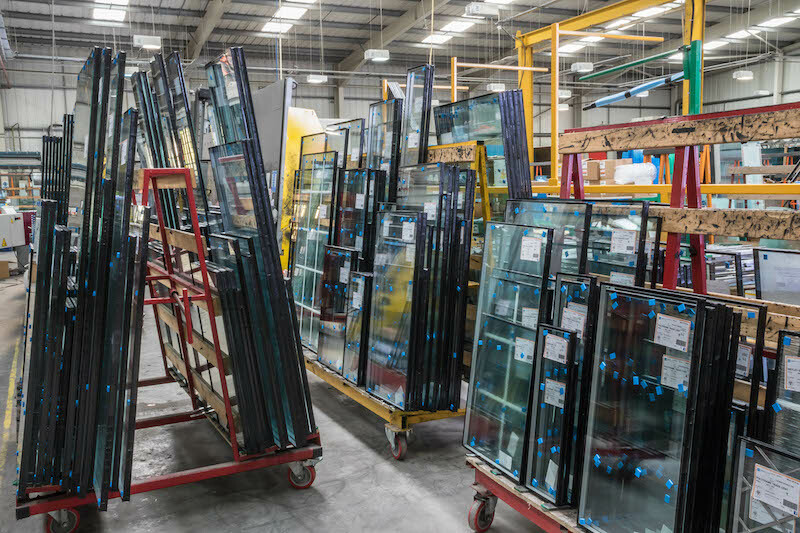 Toughening begins with the stacked glass having the edges arissed (ground smooth to avoid breakage). This is done by automated sanding belts. This creates glass particles that are washed off the surface before toughening. The glass is then placed into our furnace in the same order and blast heated to round about 600°C for approximately 3 minutes. It then moves on rollers to the cooling section of the furnace and cold air is blasted onto the surface to rapidly temper the glass. If both the clear piece and low e piece of glass survive to this point, they are paired up ready for the sealing process. Meanwhile, in a different part of the factory, a spacer frame has been assembled. The 5m lengths of spacer tube are chopped into the correct lengths to make the cavity of the glazing. Desiccant is blown into the spacer tubes and the frame is assembled. This frame then has the PIB applied to its edge at a temperature of about 110°C. 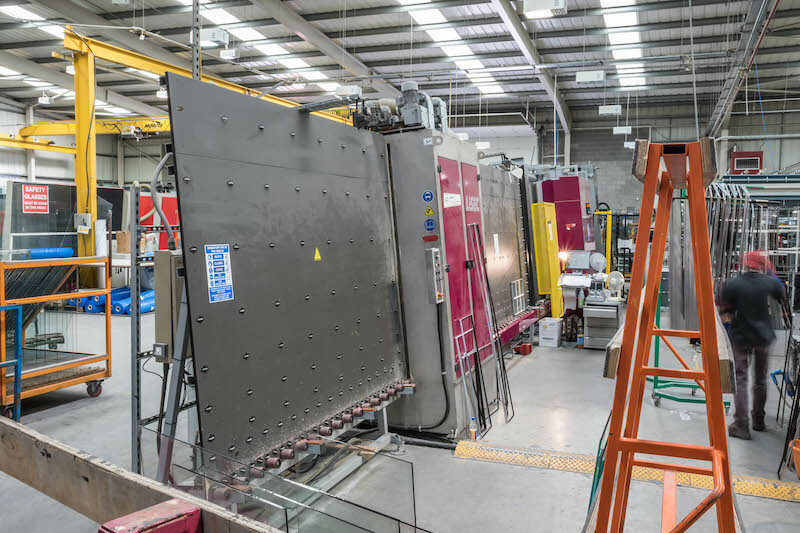 The frame is transported to the assembly area on the line ready to be applied to the glass. The glass is now at the beginning of the assembly process. Each piece is put onto our vertical production line at the beginning, to enter the washing process. 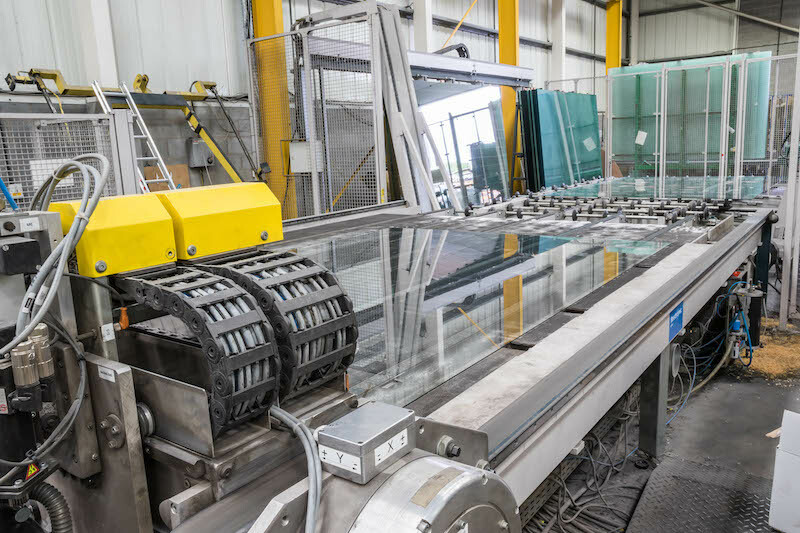 Still in specific order, the glass enters a high speed washer that has 6-brushes (3 each side) that move into contact with the glass surface. These are special soft coat brushes to prevent scratching. The water is not any old tap water! It is purified water that is PH neutral with the lime scale content removed; it has been cleaned after leaving the tap by a reverse osmosis water treatment plant. This is similar to desalination plants seen in arid desert countries. Both pieces of glass travel along the line and are inspected prior to the spacer bar being applied. The spacer is positioned using the alignment rack to achieve even sealant depths. 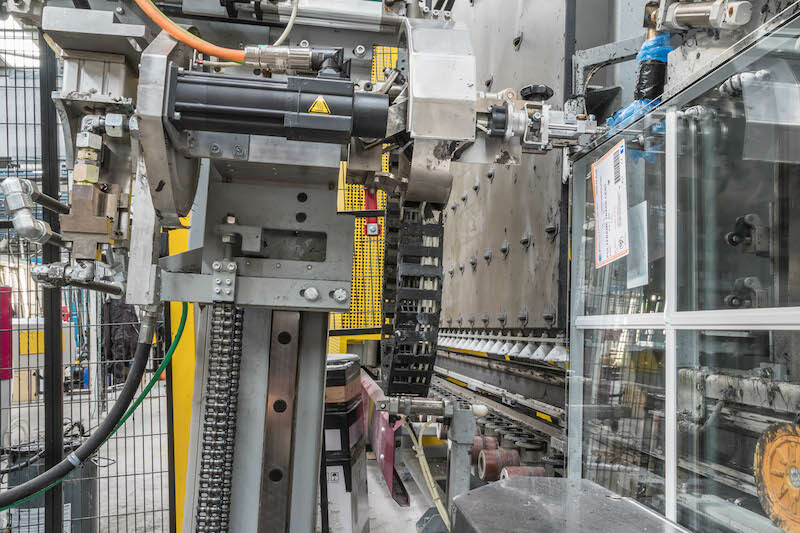 The pieces of glass then pass in to the gas press and are literally squashed together under specific pressure limits to form the primary seal with the PIB and the glass. Once squashed, they are joined together and the edge is then sealed using our precision robot. Once finished, labels and protection pads are applied and the sealed unit is left on a drying rack for the sealant to cure. It is then sorted in to customer deliveries and put on ‘A’ frames to be loaded on to our wagons. At our customers, the pallets may be fork lifted off or hand-picked and stored into their warehouse. At this point, the journey is not over. The sealed unit is then put in the back of a glaziers van and taken to its final home. The window frame is fixed in place and the sealed unit is placed in the frame and beads are hammered into the frame to keep it in place. After all that, it must then last 10-years minimum and resist heat, cold, rain, wind, boisterous children, window cleaners, pets and wildlife to keep the occupants warm dry and safe. It’s a tough life!